Revo: Break down conventional ideas revolutionize the product using research and cues from current culture to anticipate future lifestyles. Ironically, the plastic packaging of the ink cartridges were made of thicker and more durable plastic than the printer itself. Before attempting to improve upon the printer, we had to understand it to the best of our abilities. First, we analyzed the entire experience of unpacking and setting up the printer. Through the process, we noticed an excessive use of plastic in the throwaway packaging. The setup process was also unnecessarily convoluted. The manual was not very clearly written and there were too many steps. Then we took apart the printer to understand the components and inner workings. I had never taken anything apart as complex as a printer and I was fascinated by the scanning mechanism. This much technology was able to be sold at such a deceptively low price (£40) due to the razor blade business model (making money from selling ink cartridges). The ink cartridges last about 6 months and cost half as much as the printer itself (£22). That also meant that the abundance of plastic used in the ink cartridges were also frequently thrown out, creating unnecessary waste. Through our discussions, we realized we all had shared bad experiences with printers and through research, realized that the printers are easily out of order by design to force people to spend money on new cartridges and new printers. 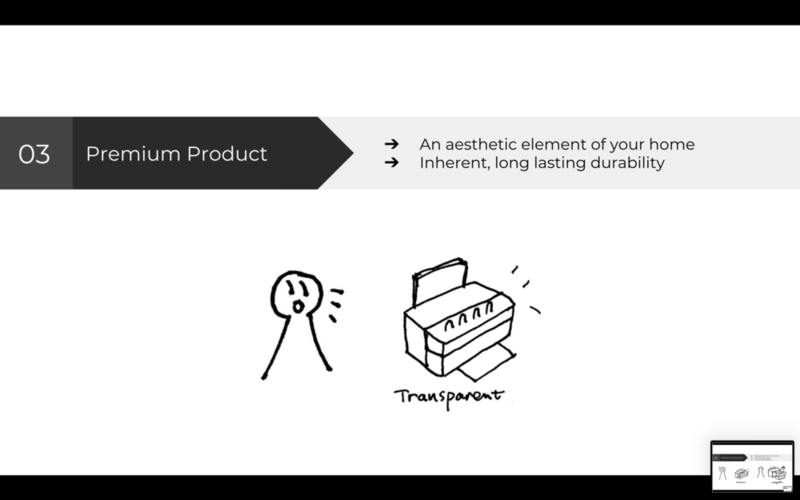 We assessed the product using the circular economy toolkit and confirmed our suspicions. The area that had the most room for improvement was recycling. Major components of a printer? 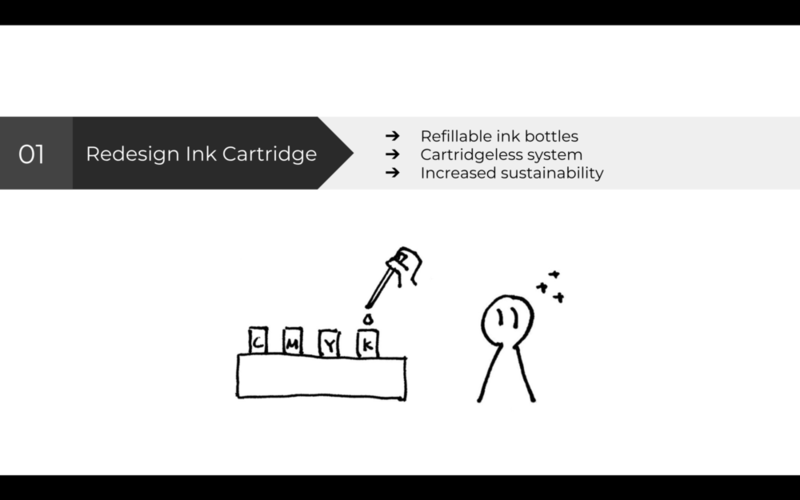 We wanted to make ink cartridges more eco friendly by making them refillable. During our research, we also read about ink cartridge scams. We wondered about the chips in the ink cartridges and why they need to be “smart”, and it turns out, they’re for telling the printer whether it’s an authentic ink cartridge from the original manufacturer and what the ink level is. However, some ink cartridges are programmed to falsely report ink levels and force people to buy new ones even though there is still enough ink left to print. We tried to bring trust and transparency back into the product by making ink levels visible through the ink cartridges. 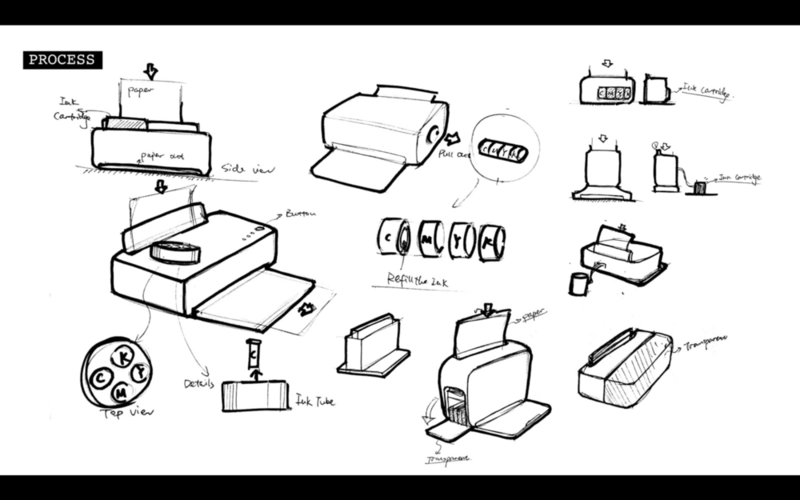 We tried to further the eco-friendliness of the new printer by making them modular in design. Since only few components were more susceptible to wear and tear from repeated use, if one part broke, you could just switch out the broken component instead of replacing the entire printer. The printer is something we only use once in a while at home now, but most of the time it’s just sitting in a corner gathering dust. How can we make it a more enjoyable part of our homes by changing the appearance of the product? We created a mood board to convey the aesthetic we wanted our printer to have that represented a durable, premium product.